Exclusive decals to letter models of Michigan-prototype locomotives and rolling stock. The new release of PM/M&NE/C&O switcher decals is still waiting for me to finalize some details with a new supplier. Over the past year, I sampled a potential new supplier, with results that weren't satisfactory. Since that time, another new supplier has come onto the scene, and we look to be on a course to be able to release the switcher set next year. Aside from the switcher set, creating any other new decal sets are on hold for now due to obligations outside the hobby. As it stands, decal sales are dwindling for a number of reasons, including the lack of available undecorated models and saturation of the niche market I've chosen to supply. The sets I have pending are waiting for me to be able to claw away enough hobby time to work on modeling projects I've intended to do. Once I have some time, I should be able to get the sets out. All bets are off, however, if my aging ALPS printer should die along the way, or I can no longer get supplies for it. In the mean time, the sets that I have listed below are still available to be ordered. There are a number of good models out to represent the Ann Arbor Railroad's steam locomotives, and now there's a set to letter them! This set will letter one locomotive and tender for the Annie. It includes prearranged numbers for an 0-8-0, a 2-10-2, a 4-4-2 and a 4-6-0, plus an assortment of numbers to allow you to letter any other Annie steam locomotive. Please see Ordering Information for postage cost before placing your order. 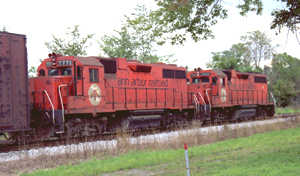 In the early 1980s, the Ann Arbor Railroad Acquisition Company, operating as the Ann Arbor Railroad, acquired three ex-Conrail/ex-Penn Central GP38 diesels. While they painted these orange with a black and white herald and black lettering, the arrangement was considerably different from that of the former Ann Arbor Railroad's DT&I-inspired GP35 paint scheme. During the 1930s and 1940s, the Manistee & Northeastern received a dozen hand-me-down wooden boxcars from the PM. Numbered 4000-4011, these double-sheathed cars were taken from the PM's 85000-86000 series. While no perfectly accurate models exist, available models of the USRA double-sheath 40-foot boxcars make acceptable stand-ins. Each set provides enough white lettering for one boxcar. 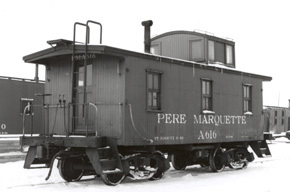 In 1937, the Pere Marquette purchased its first steel cabooses, a group of 25 cars from Magor. In 1941, it purchased its final group of cabooses, 40 similar cars from ACF. These groups of cabooses were very similar to each other, as well as to contemporary cabooses purchased by the C&O and the Missouri Pacific. Over the past 30 years, a number of models have been released in brass, and most recently in plastic, that are either accurate models or reasonably close stand-ins for the PM's A901- and A950-series steel cabooses. Each set contains roadname lettering, dimensional data and servicing marks to accurately letter two of the PM's A901- and A950-series steel cabooses, or one of the A900-/A950-cabooses and one of the A800-series wood cabooses built for the PM in 1930. The HO version of this set, along with Tahoe Models Works #104 or #204 Bettendorf swing motion trucks can be used to make a PM A800-series wood caboose from JJL Models' recent Erie C4900-series resin caboose kit. The caboose most uniquely associated with the PM is the wooden "three-window" caboose with its cupola offset toward one end. This type of caboose, based on a Flint and Pere Marquette design, was built from the 1880s through the mid-1920s, with many lasting until the mass-retirement of wood cabooses circa 1971. These cabooses were numbered seemingly at random between A275 and the low-A600s. Each set contains roadname lettering, dimensional data and servicing marks to accurately letter two of the PM's "three-window" cabooses as they appeared from the late 1920s to the late 1940s. In 1924, the Pere Marquette's Wyoming Shops built 300 wooden refrigerator cars to help handle its seasonal produce traffic. Now, for the first time ever, we are pleased to offer a decal set specifically designed to accurately model these cars, featuring prototypically-accurate lettering and dimensional data. While no completely accurate models of the PM's 25000-series wooden reefers are currently available in HO scale, the illustrated instructions accompanying this set describe methods to modify Accurail, Tichy, or Red Caboose kits to make close approximations of these cars. The Intermountain Fruit Growers Express wood reefer is nearly identical to the PM car. Each set letters one refrigerator car. The PM purchased its last two snowplows in April and September, 1944. Plows SP-21 and SP-22 were fairly typical steel plows from Russell which the PM painted boxcar red with black roofs. Both Overland Models and Walthers have produced HO models of this style of plow, and this set will letter one for either SP-21 or SP-22. Each set provides enough white lettering for one plow. Please pay by check or money order only, payable to Fritz Milhaupt. Please do not send cash through the mail. I do not accept credit card orders, or orders via phone or e-mail. All orders are shipped via the postal system, unless other arrangements are made. Orders placed without including payment for postage and packaging will be returned unfilled. Projects underway, but currently on hold, include sets to letter Michigan Northern E8B/Steam Generator Car #671, Manistee & Northeastern and Ludington & Northern 0-6-0s, and Manistee & Northeastern combine #9. With Atlas having released its Detroit & Toledo Shore Line cylindrical hopper, I've discontinued work on that set. I've put together a sheet describing the techniques that have worked the best for me when applying decals. It is available for download as an Adobe PDF file here. There are many other people in North America who produce small lines of decals to model specific prototypes. Many of these are enthusiasts, like myself, who created sets to allow them to letter specific models they wanted for their own use. A very good list of these small manufacturers can be found at Bill Mosteller's Great Decals! site, at http://www.greatdecals.com/. Bill produces a fine line of decals, himself. The single best source of information on the locomotives and rolling stock of the Pere Marquette and the Manistee & Northeastern is the Pere Marquette Historical Society. Members receive six issues of PM Tracks, the bi-monthly PMHS newsletter each year. Members also receive notices of special projects, such as special-run HO PM models. These decal sets are independent projects of Fritz Milhaupt, and are neither products of nor are specifically endorsed by the Pere Marquette Historical Society, Inc.,. the Chesapeake & Ohio Historical Society, Inc., CSX Corporation, nor Pioneer Railcorp. All original contents of this Web site are Copyright © 2015, John F. ("Fritz") Milhaupt, All Rights Reserved.